Move over Grumpy Cat and fellow kitty friends, a new animal favorite is arising on the internet. 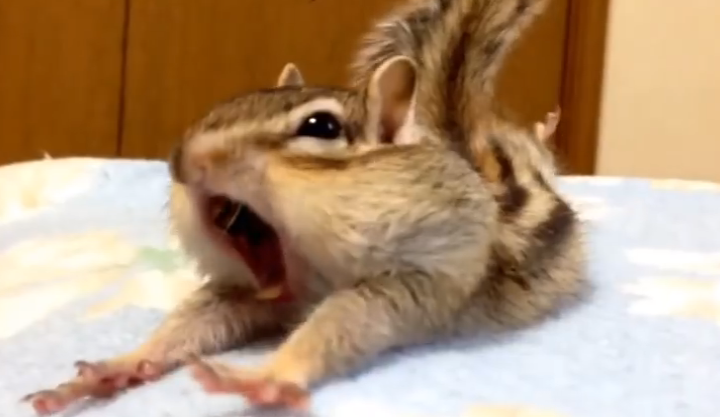 His name is Bikke and he is an insanely adorable chipmunk who hails from Japan. Everything about this tiny guy, from his chubby cheeks down to his furry little tail, exudes cuteness. People the world over are sure to fall in love with Bikke once they see him do his morning stretches. A clip of the fritter shows him releasing a big yawn as he simultaneously stretches his legs out behind him and his arms in front. As he begins to loosen up he snuffles around on the bed and twitches his nose. When doing his movements he drags his legs around behind him while pulling his body along with his front claws. Over and over again he yawns, pulls himself along, twitches and repeats. It is as if he cannot quite wake up from his nap and needs to keep on stretching. He even appears to have developed a new form of stretch technique which has possibly never ever been seen before. Maybe he has invented the downward facing chipmunk!! Either way, the whole scene definitely qualifies as a cuteness overload moment. This little chippy sure has a great life as is evidenced by his YouTube channel, bikke the chip. Other available videos show him stuffing his cheeks with food, watching cartoons, and playing around with his mini-house set. His owner’s clearly love and adore him and so do we. Check out his videos and try some of his stretch moves, your body will surely thank you for it.